The veil has finally been removed for the relaunching of Suter’s two-stroke grand prix track bike, now named the Suter MMX 500. As expected, the machine gets a modest makeover visually, and appears to remain largely unchanged mechanically. Officially making 195hp at 13,000 rpm, the Suter MMX 500 weighs a paltry 280 pounds (127kg). For that kind of power-to-weight ratio, you are going to have to spend some serious coin, 120,000 CHF ($123,360 in today’s money). Only 99 examples of this machine will be built – all to customer-spec, of course. That price tag gets you a 576cc two-stroke V4 engine, that has a 56 x 58.5mm bore and stroke, double counter-rotating crankshafts, and electronic fuel injection. Suter says that power plant is good to get the MMX 500 up to a true 195 mph (310 km/h). 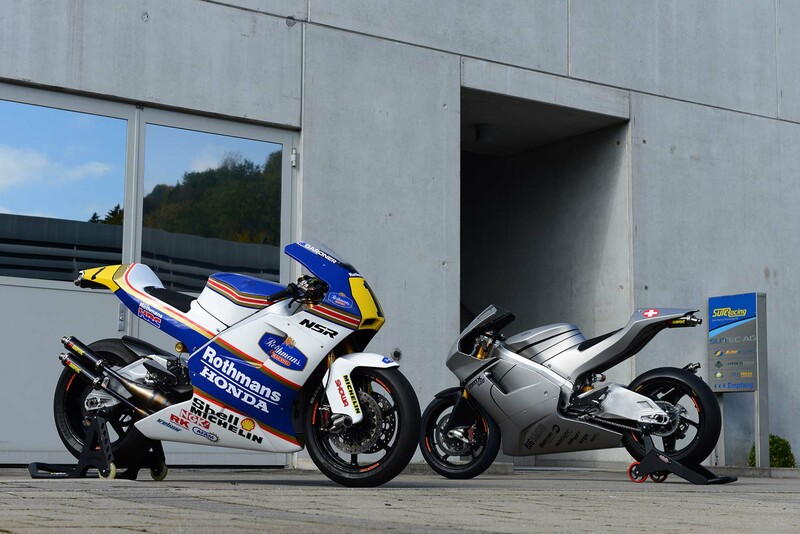 Suter hopes that interested buyers will field their machine in the GP Bike Legends series, which pits two-stroke era racers back on their smokey machines. We’re not so sure about that, but the Suter MMX 500 is easily the ultimate track day queen.